Allowing a full 180-degree range of motion on three different planes, the shoulder is a truly extraordinary joint. It is a complex structure made of three separate joints, working together to give you a tremendous range of motion. Yet, it is often true that the more a joint can do, the more can go wrong — and so the more specialized treatment it requires. 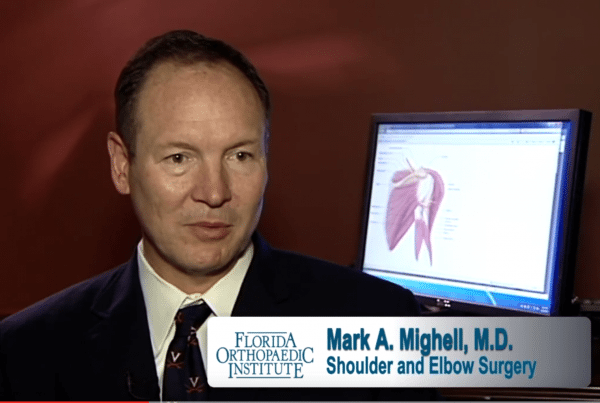 Florida Orthopaedic Institute physicians have the expertise and experience to provide comprehensive care of the shoulder including nonsurgical treatments, arthroscopic, and open surgeries. Since your shoulder is such a complicated part of your body, there are many conditions that can affect it. The following helps provide you with an overview of some of the more common shoulder ailments. 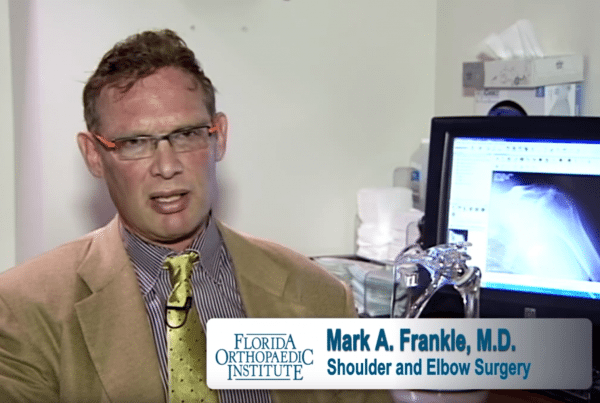 Surgeons at Florida Orthopaedic Institute use shoulder arthroscopy to examine and repair various problems inside and around the shoulder joint, using very small incisions. An arthroscope allows the surgeon to see all the structures inside the shoulder and make repairs using specialized instruments. Because the arthroscope and surgical instruments are small, the surgeon only needs to make small incisions. Smaller incisions result in less pain and shorter recovery time. Most shoulder arthroscopies are performed an outpatient basis without an overnight stay at a hospital. 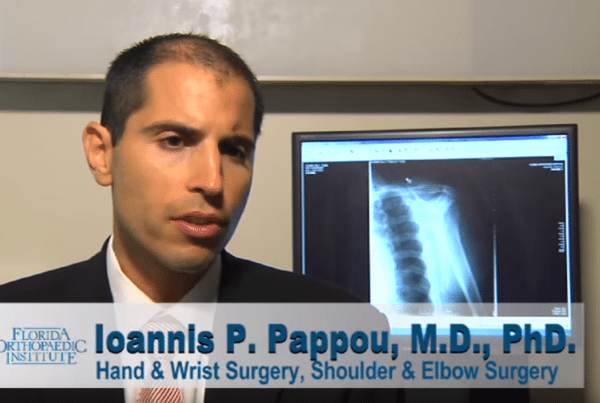 Arthroscopic surgery treats a variety of common shoulder problems including rotator cuff tears, labral tears, shoulder instability, impingements bursitis, tendonitis, and arthritis. Overuse injuries from continually over-exerting activities are some of the major cause of bursitis or tendinitis. Overuse injuries are commonly found in individuals who play competitive sports, but can also be related to repetitive activities such as painting or stocking shelves. The overuse activities cause friction and scraping of the rotator cuff and its nearby joints. Bursitis or tendinitis is cared for by moderating and reducing the activity, along with a rehabilitation program prescribed by a Florida Orthopaedic Shoulder specialist. Shoulder impingement is typically found in athletes that regularly do over-the-head motions. 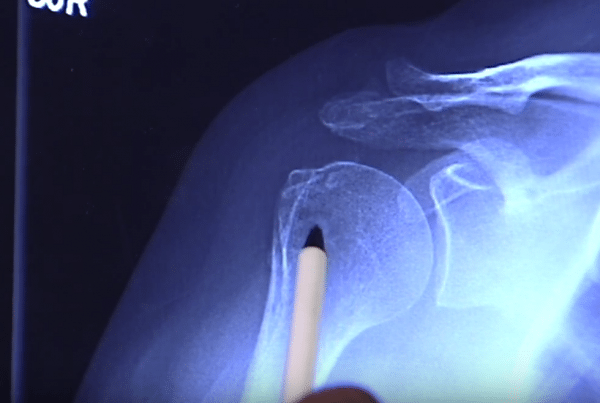 If medical expertise is consulted and treated in the early stages, shoulder impingement can be corrected in a conservative nonsurgical manner. Delaying consultation can result in more damage to the impingement. If you are experiencing pain while performing an overhead activity, consult a Florida Orthopaedic Institute specialist as soon as possible. If this condition is detected early on, adjusting the associated activity including prescribed physical movements/exercises and, possibly, a cortisone injection may return you to your normal activity. If this is not successful, surgery may be required. A significant injury, such as falling, can cause a rotator cuff tear. Rotator cuff tears can also be caused by a prolonged breakdown or degeneration of the associated tendon. Symptoms may include a radiating pain from your shoulder down your arm, pain while sleeping on the affected side, or weakness of your arm while attempting to perform daily activities. The more the pain worsens, the more it probably indicates that the tear is getting larger. If you experience these or similar symptoms, it’s important that you consult with a Florida Orthopaedic Institute surgeon who specializes in this area. 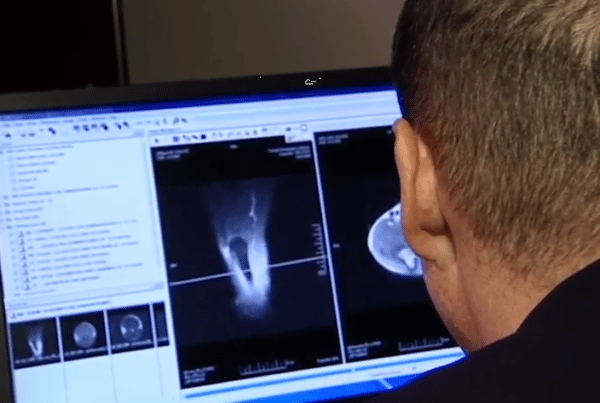 Your surgeon will likely recommend an MRI (magnetic resonance imaging) to confirm and identify the extent of the injury. If identified early on, nonsurgical treatment may care for your rotator cuff tear. Prescribed under the care of your Florida Orthopaedic Institute surgical specialist, nonsurgical care may include anti-inflammatory medicine, cortisone injections and physical therapy. If your tear is significant and has not responded to a nonsurgical care approach, surgery will probably be recommended. The goal of our shoulder specialists is to collaborate and work with you to relieve your pain and restore your strength. Fractured collarbones typically occur in children or people who fall on the side of their shoulder. Most these injuries can be cared for nonsurgically with a sling and/or splint. If the injury is found to be a severely displaced fracture or joint separation, you may need require surgery. 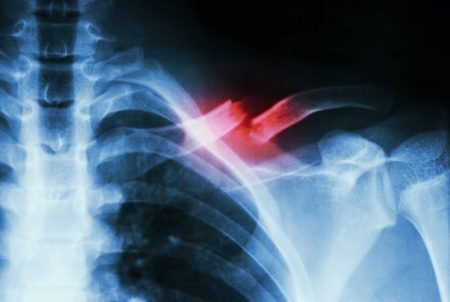 At Florida Orthopaedic Institute, we have physicians who specialize in providing comprehensive care of the shoulder, including fractured collarbones. 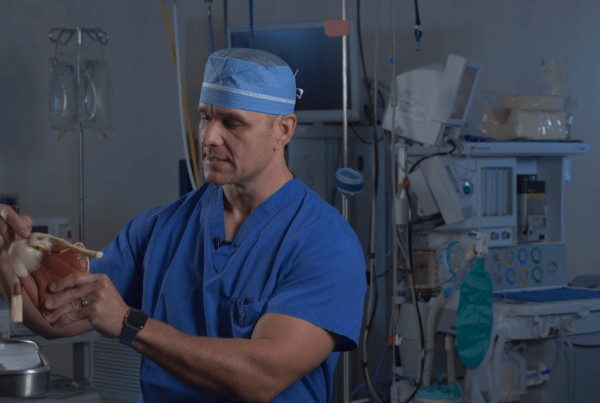 Surgeons at Florida Orthopaedic are now repairing rotator cuff tendon tears quickly with a new minimally invasive surgical approach using the latest technology: a postage-sized bioinductive implant that induces new tendinous tissue to grow and help tendons heal. Rotator cuff tears are caused by a variety of factors, including genetics, trauma, age or activity-related injury. Tears that start out small often develop into larger, more painful and debilitating injuries due to continuing degeneration of the torn tendon. This new technology biologically augments the tendon through the induction of new tendinous tissue growth helps patients get back to the activities they love. Shoulder arthritis can affect your range of motion and ability to do everyday things. It can be caused by a number of different factors including osteoarthritis and rheumatoid arthritis. Often hereditary, osteoarthritis most commonly occurs in people over the age of 50. Osteoarthritis in younger people can be a result of an injury or trauma, such as a fractured or dislocated shoulder, known as posttraumatic arthritis. Pain while (and after) moving the shoulder, pain while sleeping and a limited range of motion are common symptoms. Physicians at Florida Orthopaedic Institute are nationally renowned for treating shoulder arthritis and in shoulder replacement surgery. Osteoarthritis strikes when the shoulder joint wears thin. Rheumatoid arthritis is caused by inflammation of the lining of the joint that that ultimately destroys the lining of the joint due to the chemicals produced. Degeneration and tearing of the tissues can also result. If you have pain in your shoulder that limits your motion, your Florida Orthopaedic Institute shoulder specialists may recommend replacing the head of the bone or the entire socket. As always, your surgeon will discuss the best treatment options for your situation. A Bankart Repair is a minimally invasive surgical procedure that repairs a tear of the glenoid labrum in the shoulder. When the shoulder pops out of joint frequently and tears the inferior glenohumeral ligament, it’s called a Bankart lesion, named after English orthopedist Arthur Bankart. A Bankart Repair re-anchors the torn pieces of cartilage to restore security and stability to the shoulder. When the biceps muscle is torn from the bone at the point of attachment (tendon) to the shoulder, a biceps tendon rupture occurs. While this can occur at the elbow, the biceps tendon is most commonly torn at the shoulder. Biceps tendon ruptures occur more often in men than women and most injuries happen at 40 to 60 years of age due to chronic wear of the biceps tendon. In younger individuals, the tear usually comes from trauma such as an auto accident or fall. Biceps tendon ruptures can also occur at any age. People who perform repetitive overhead lifting, work in occupations that require heavy lifting and athletes who lift weights or participate in aggressive contact sports are at risk.